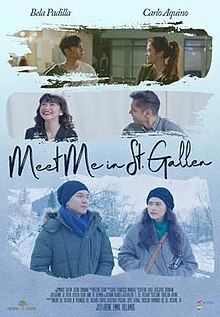 Meet me in ST. Galen is a 2018 Romantic Comedy Drama; Starring Bela Padilla and Carlo Aquino. 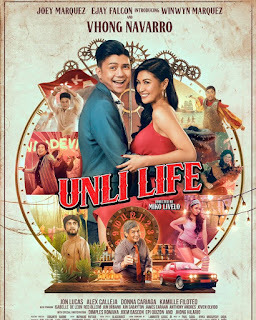 Written and Directed by Irene Emma Villamor and Produced under Viva Films and Spring Films. The film follows Celeste (Bela Padilla) a graphic designer who has an argument with her boss which leads to the decision to quit her job. That night she meets Jesse (Carlo Aquino) a frustrated musician forced by his parents to study medicine. Celeste also uses the name Katy Perry every time she orders coffee. Celeste and Jesse realize their names are similar to the romantic comedy movie ‘Celeste and Jesse Forever’. The story is told only in 3 days and each day cuts out several years later. On the 1st day is when Celeste and Jesse first me on a coffee shop where they talk about their dreams and the sacrifice they have to make. They end their night with a kiss and the movie forwards 4 years later or in the movie is day 2. On day 2; 4 years later, Celeste and Jesse suddenly meet on a coffee shop where Jesse now uses Brad Pitt when he buys coffee. Celeste is now a successful artist and Jesse is now raking up veterinary medicine, the two talk about what has happened in their lives for the past four years. Day 3 which is 2 years later; Celeste now lives in St. Galen, Switzerland and Jesse surprises her. The movie now leaves the two to decide their future. The film offers a fresh pair of love team. One that surprisingly is funny, interesting and lovely. Bela Padilla and Carlo Aquino never fail as the trailer looks interesting enough. It makes us wonder, what will happen once they meet again in St. Galen. Will it finally end in something meaningful? The answer in your question will only be answered once you watch this film.